As far as twitch games go I’m old school. I like shooting at stuff that’s moving across the screen before it comes to get me. That’s how the timeless classic Space Invaders works, and I like Space Invaders. 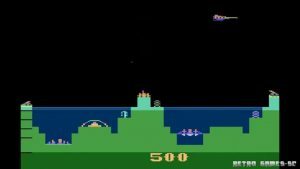 Atlantis is a lot like Space Invaders in that you need to shoot stuff before it comes to get you. But Atlantis, in my opinion, has a lot more storyline going on, so I’m even more partial to Atlantis. In all honesty this is a super simple game with very little variation. It just gets harder and harder as the enemy ships get faster and more abundant. The strength of the game is not the game play, it’s the potential for the players to use their imagination as they play. I think that’s what’s missing from the really advanced games we have available today. The insane lifelike worlds that get created now leave little for the player to imagine. 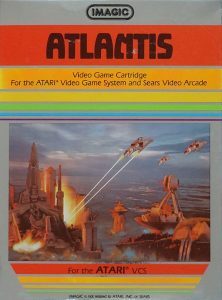 But a game like Atlantis left everything to be imagined and as a kid I did just that, and I still do when I play the game today. Is this enemy ship a side view and it looks like a Star Trek Federation ship, or does it have a transparent round pod on the front? I like to go with it’s a round transparent pod because I like crap like that. Why are the attack ships so freaking huge? I mean they’re like the size of buildings and they have more than one window on the side. They look a little like Star Wars Star Destroyers or something. I like to imagine that this invasion is on a capital ship scale because the invaders are from another planet and this is their attack/colonization force. Who lives in the small size buildings? I like to imagine that these are exclusive condos where the crème de la crème of Atlantis live up in the hills near the water surface, and the main defense gun. Why do you need an underwater bridge? Is this an underwater bridge or is it just some sort of power station, or maybe a fancy dwelling, or even a prison? I like to go with underwater bridge. These are just a few of the musings that always come up when I play Atlantis. All in all I love this game. I might play it now!